IRVINE, CALIF. – (RealEstateRama) — The Max C. Tipton Award for Marketing Excellence was recently presented to Nick Lehnert of KTGY Architecture + Planning at the 2016 SoCal Awards at the Disneyland Hotel in Anaheim, California. This annual awards gala is presented by the Building Industry Association’s Greater Sales & Marketing Council of Southern California and recognizes the best in professional achievement, sales, marketing and design throughout the region. As executive director of design strategies at KTGY, Lehnert brings a wealth of knowledge to the building industry, an understanding of disciplined design that matches client and project objectives, as well as in-depth market and consumer knowledge that continues to develop and advance innovative residential design concepts. Lehnert supports the 375 + person firm by maintaining a leadership role through an aggressive research and development program. He is also active in strategic marketing/branding and business development efforts. Before joining KTGY, Lehnert’s 40-plus year career in homebuilding has included being an owner/ partner in marketing and sales-disciplined companies. As well as key positions as vice president of strategic marketing and product development for the South Coast Divion of Centex Homes, and vice president of sales and marketing for KB Homes, Zellner Communities, and Distinguished Homes. Since 1970, the Max C. Tipton Award has singled out an industry thought-leader who is a true visionary and never stops giving back to the industry. By honoring the late Max Tipton, the award doesn’t merely focus one successful career; but rather a skilled professional in marketing and merchandising that spans several years. The jury for this award consists of all the past Max C. Tipton award recipients that span back several decades. Celebrating 25 years, KTGY Architecture + Planning is an international award-winning full-service architecture and planning firm delivering innovation, artistry and attention to detail across multiple offices and studios, ensuring that clients and communities get the best the firm has to offer no matter the building type or location. 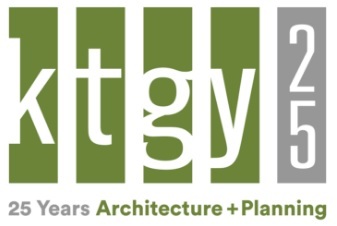 KTGY’s architects and planners combine big picture opportunities, leading-edge sustainable practices and impeccable design standards to help create developments of enduring value. KTGY serves clients worldwide from offices located in Chicago, Denver, Irvine, Los Angeles, Oakland, Pune and Tysons.